The reason is that this is the crucial phase for the student. There can be anywhere from around 18 to well over 40 music symbols in a line of music. If the student is given too much too quickly, he can get confused. 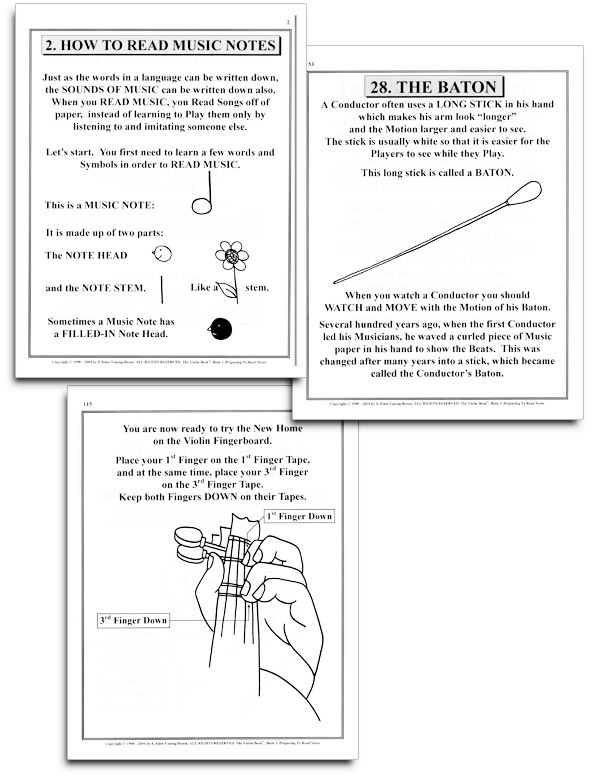 The simple new way to teach the language of note reading! When I was teaching, I became aware of a "fact" accepted by many teachers and even parents: that it was not unusual when a simple step-by-step introduction to music reading was not used, for children to sometimes put up a resistance at the stage of starting to learn to read notes. The strange situation of some previously excelling students losing interest, baffled some teachers and parents. Instinctively, this type of situation was not something I believed had to happen. I found myself in the position of creating a youth symphony with a group of one and two-year 'rote trained' students who couldn't read a note. It made absolutely no sense to give them the music pages to the songs they had already played, with a brief introduction to note reading, and basically just "let" them "figure it out." 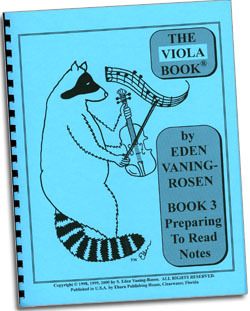 This became the foundation for The Viola Book 3: Preparing to Read Notes. What are the secrets of following a Conductor in an orchestra, and how do the bows of the viola players always seem to go in the same direction at the same time? Is it hard to play fast on the Viola? Learning to play fast notes on the viola is easy when it is learned as a gradually developed skill. Young students often attempt to rush through everything. Most people really appreciate the carefully presented fast note approach introduced on Page 22 and used throughout Book 3. If one follows The Viola Book Series Program, not skipping any pages or drills, and carefully learns each part, a well-taught, confident Violist emerges who has the Technical expertise to reach any level of dreams of artistic endeavor he wishes to accomplish.